It is very easy to get “stuck”. You find a place that is comfortable… a protected anchorage, lots of friends, things to do ashore and access to services. Somehow your dance card just keeps filling and filling as days roll into weeks. You tell yourself that this is what it’s all about… no need to leave this safe place and go back out into the unknown. Why? There’s no hurry, no agenda... But that is just fear talking. The guidebooks say that you can’t plan cruising around shoreside events. You have to go when the weather says go… and you have to be ready. Ready at a moment’s notice. We weren’t ready. We had been watching the weather for days hoping for a clear pattern to open the window for us to leave Thompsons Bay, Long Island. It looked like the timing just wasn’t right. We wanted to stop at Calabash Bay, which needs winds and seas with no northerly component, followed one or two days later by very light winds from the west so that we could sail (or motor) to Conception Island for a couple of days… then we wanted north to northeast for a run to Rum Cay before we continue on. A lengthy review of the weather on Monday morning said we could either skip Calabash and make a run for Conception… or plan on staying put for at least another week… Bruce voted to stay and I wasn’t opposed. There was plenty to do around the Bay and we wanted to attend a Beach cleanup on Saturday with the other Cruisers here. Decision made! That decision stood until about five minutes later when we watched our friends aboard Encore motoring out of the Bay… Suddenly we were lonely. I told Bruce that we could go… It wouldn’t be perfect at Conception Island but we can always go back again when our time in the Caribbean is done. We could spend tonight there and then continue on to Clarencetown tomorrow. We could even wait around there for better weather and still attend the beach cleanup party! Our desire to move on with our cruising plans battled it out with fear, anxiety, indecision, comfort, and those forbidden shoreside plans. No time to quibble, stay or go? STAY or GO??? If we’re going we’ve got to go NOW!!! We stared each other in the face, each looking for the answer in the other… Let’s GO! 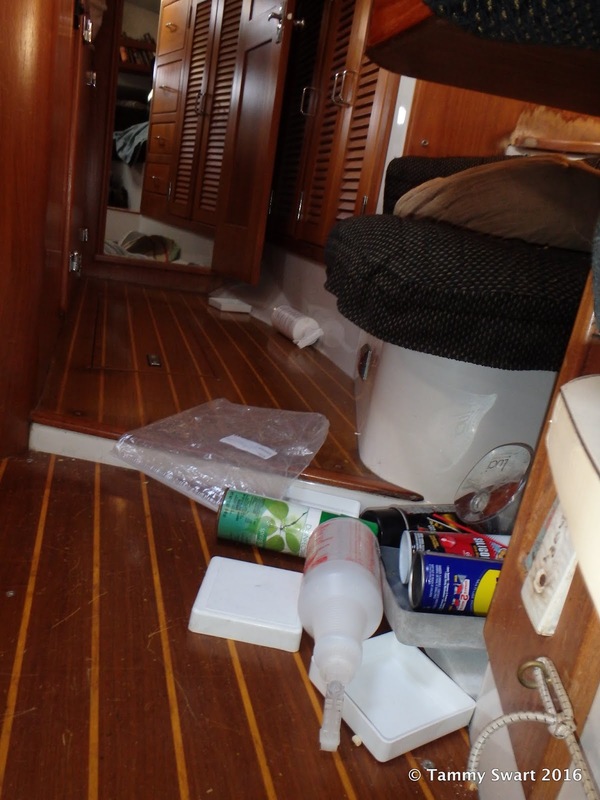 And so… we were Off-Like-A-Prom-Dress… We quickly shut hatches, raised the dinghy onto the davit, locked the outboard onto the rail, started the engine and navigation instruments and pulled up the anchor. We said goodbye to the Bay on the morning net and motored out of the Thompsons Bay without even doing the dishes. Once we were underway, we could feel the inertia releasing its grip. It felt good to be going again. If we didn’t go now, it could be weeks before the right weather pattern presented itself. So what if we can’t snorkel on Conception Island… it’ll still be there when we return. And Clarencetown has a stunningly beautiful anchorage with protection from most directions. That would be good because there is some more ugly weather on the way. We enjoyed the beauty of Long Island’s west coast as we motored into the wind. Did I fail to mention that the first part of our day would be spent motoring… yep… straight into the wind. But it was light and we’re used to it. It’s just another opportunity to make water, which we did until we breezed past Calabash Bay and rounded the northern end of the island. The Columbus statue stood noncommittally watching our progress as the sails rolled out and the waves got bigger. 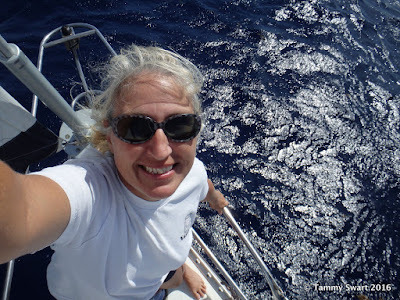 The northwest winds were picking up waves, which joined the northerly swell to make a somewhat lively sea state, but the boat handled it well and we made good time motor sailing to arrive well before dark. We watched as Encore crossed our bow, now heading off toward Mayaguana and leaving us to our own route toward Puerto Rico. ‘Bye Sally! ‘Bye Jerry! See you later! About five miles out on our approach to the shallows of East Bay, I began to get nervous. I tried to visualize the entry and worried that the swells would make it difficult to control the boat as they suddenly pushed the seas up onto the shallow banks. I began to doubt the sanity of this plan. Maybe we should have stayed where we were until a really favorable forecast materialized. But that may never happen! I settled with a wait-and-see attitude. What else could I do??? As we approach the island, if it looks bad, we can always fall off and just keep right on trukin’ to Clarencetown. But I was very nervous. My stomach was clenched and I was hyper-focused as I stared at the crashing waves hitting the reef to our right. I kept looking from the chart plotter to the island, trying to make it fit… I looked at the angle of the swell and hoped that coming from the north, they would not wrap around and try to stuff us into the opening between the reef and Wedge Point. I was relieved to feel the motion of the boat calm as we left the waves behind and motored onto the clear shallow sand bank with coral heads still easily identifiable in the waning afternoon light. Now borne on a gentle swell, Bruce went to the bow to spot coral heads for me but I soon called him back from his post. No need. I could see them. 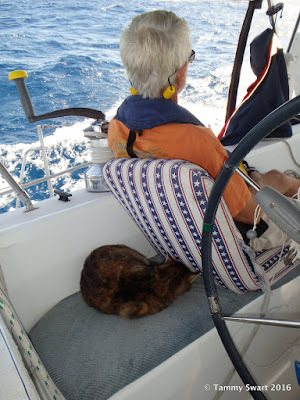 We dropped the sails and motored along the coast looking for a spot that was less rolly. I guess these little islands that poke up out of thousands of feet of ocean never see calm waters, no matter which direction the waves are coming from. The swell always seems to wrap around and find us. The water was deeper than I expected, in the 20’s and I would prefer to find a spot with less than 15 ft. of depth so that we could reduce scope and not damage any of the coral heads. We found such a spot very close to Boobie Cay at the far eastern corner of the bay. The gentle roll seemed less pronounced here, maybe due to the water coming in from the break in the reef to the NE. Whatever the reason, we would take it. We dropped the anchor just as the sun went down. The anchorage is very beautiful and it is a shame that the weather wasn’t more settled. There are lonely beaches beckoning to us, and coral patches to snorkel right off the stern… but it is too windy and cool to even think of getting into the water. We had leftover chili for dinner and went to bed early with plans to leave at first light. I closed my eyes and thought how it was a little disconcerting to suddenly find ourselves out here alone in the wild with little access to the world. There is no cell tower on Conception Island. There were no other boats, which only reinforced the doubt in my mind that this was a good decision. Long Island was the last of the islands we had previously visited and going forward from here will all be new. And while that’s exactly why we are out here… it’s been quite some time since we were out of our comfort zone. We’ve grown used to being… well… comfortable! From here on we’re on our own. And it’s a little scary. The rolling lessened overnight so we both were able to get a good night’s sleep. We jumped out of bed after listening to Chris Parker and greeted the sunrise still a little disappointed at leaving without exploring, but I had more important things on my mind. The wind was up and we needed to get out of here before the westerly winds and waves increased. We could just see the dark patches of reef as we raised sail and motored off of the banks and back to the big water. And it was quite a bit bigger water than yesterday! The west winds were fetching from afar as we were still north of the protective lee of Long Island. Soon (I hoped) we would begin to feel it’s calming effect and the waves would drop to a more comfortable level. Jezabelle was sick for a bit, but then she stoically took her position behind Bruce where she could get out of the wind and be on the low side. Poor baby. A pod of small dolphin came suddenly up from the waves and we were thrilled to see them cavorting in our wake! There must have been 8 or 10 of them, very tiny. I guess they don’t get much to eat here on these barren banks. They left us and slowly we began to feel the calming effect of Long Island in the size of the waves. It grew more comfortable and Jezabelle was fooled into thinking we were done. She revived long enough to eat and take a trip to the catbox, then returned to her post as we neared the entrance to Clarencetown’s harbour. The sea state was such a delight that we began thinking of maybe continuing on. I downloaded a weather report and conditions looked so favorable for making or way south in the next couple of days, we had to ask ourselves… can we risk passing this wind by? But we’ve got plans in Clarencetown on Saturday… What about the beach cleanup? Our friends are expecting us! I remembered what the guidebook said about the dreaded shore plans. We decided to take the perfect winds and sea state we had magically been given and just keep going. So now instead of pulling into Clarencetown, we would take shelter for the night in the anchorage at Little Harbor, just a few miles further south. That way we would have a head start on making a day-hop to the Acklins Island group, our next destination of choice. Maybe we would even make it all the way to the southernmost tip in one day…. As we approached the entrance to Little Harbor we could see that even with the west wind blowing offshore, the swell was causing huge breakers to crash upon the reef at either side of the approach. Perhaps we could have made it inside safely, but I lost my nerve. We just kept on going. No time like the present to turn off the engine and stop rushing. We would meander slowly all night to the last little anchorage of the Acklins Islands and take refuge there to await our next weather opportunity. One more dinner of chili leftovers would get us through the night and I could take the time to prepare some passage meals at our next stop. We left so fast that we weren’t ready. We had no groceries and would have to live on whatever we have on hand until we reach Great Inagua, some days away. We enjoyed the sunset with dinner and were actually looking forward to the overnight sail. Little cloud rainbow... that's a good omen... right? Bruce took the first sleep and I was alone. I looked for falling stars but found only those in our wake as the sparkles of thousands of tiny phosphorescing creatures expressed their displeasure at being rudely tossed aside by our bow. There is no way to get this on camera to share, which is my biggest regret of the night. I felt like I must be one of a chosen few to see this and it did not go unappreciated. Pre Dawn... we made it! The winds held steady but light with only the odd shift now and then that made the sails flap. I turned off course enough to keep the noise down while Bruce slept and the fact that this made the boat go more slowly was a good thing. At this rate we would reach our destination just after sunup. I had counted on the dying wind to keep us going slowly and to make a pleasant night. Bruce came up and took a watch while Jezabelle and I dozed down in the aft cabin. If she was confused about why we weren’t stopping she didn’t express it as long as she got to go to bed when it got dark. I slept dozed comfortably but was wide-awake within three hours and went back up to take my next watch. This is almost unheard of for me. Normally I can’t stand to be forced to leave my bed and go back up. I can only attribute my newfound superpowers to the fact that I am no longer stressed out and tired all the time. I have finally found my Cruiser Groove and can put aside the normal sleep rhythms that formerly made overnight passages intolerable to me. I stood watch for a while as Bruce caught a nap in the cockpit. We made a few sail adjustments, rolling in the jib to reduce flogging noise as the decreasing wind left us prey to the rolling waves. I watched a couple of ships pass in the night both on the AIS screen and by the dim lights in the distance. I suddenly noticed a red light up ahead as we approached one of the settlements in the Acklins Islands. I hesitantly woke Bruce to check it out… We couldn’t tell what it was but a red light would indicate a vessel passing before us from starboard to port, with it’s port side displayed to us. But it didn’t seem to be moving. My perspective was all off and I couldn’t tell the distance. I would just keep an eye on it while Bruce continued to doze. While only a mile and a half to land, I called time to jybe back out again. That light must be on land but I saw nothing indicating its presence on my chart… We turned the boat away from the islands and continued on our way back out into the total darkness. Bruce woke up and took his watch while I grabbed another hour down below. When I opened my eyes again I could detect the approach of dawn. Arriving back to the cockpit I consulted our position and saw that we were maybe ten miles from our destination and would arrive with just enough sunlight to make a safe landing. I could download another weather report from this close to the Island and took a look… It said we should just keep going. How long would we wait for another opportunity such as this? The seas would be less than 3.5 ft. and from behind, the winds would be 8 to 11 knots and also from the NNW. We did some calculations to see how long it would take us to get to Great Inagua and it looked like we could do it if we could make at least 6.5 knots. We would have to motor-sail again, but it would put us far ahead of schedule. With only moments to decide…each one ticking off and pushing our average needed VMG a little bit higher… We decided to go for it! So now, not only were we Off-Like-A-Prom-Dress… but we were tossing the stillettos, the lacy lingerie, and Grandma’s pearls into the teeth of the north wind as sacrifice to her benevolence. We were both super nervous as we started up the engine again. No use in thinking of how we could have been moving faster all night to reduce our distance to this next destination… that ship has sailed. We’ve gotta make time NOW! With the sun just rising from her wavy bed, we powered on towards our last Bahamian Island. The ride was so comfortable I went down below and did the dishes that we hadn’t done since Thompsons Bay… Bruce cleaned up the clutter of stuff that had been tossed to the floors by the waves leaving Calabash. Remember? We hadn’t prepared for our departure. Normally for an offshore passage we would have battened things down a bit. Put things away to keep them from being flung. We would have prepared passage meals that were easy to grab or prepare in unknown sea-state… Now here we were out of lunch meat and with no leftovers…left. But we were headed for our destiny, who cares if our tummies are grumbling… we’ve got cookies! Throughout that long day, (it could be 12 hours or 10) we took turns at watch, both for ships, sail changes or whales. I did so want to see a whale now that it was daylight and we wouldn’t be hitting them… The water was deep blue and we had scattered clouds. The waves pushed us along, the boat surfing to nearly 8 knots at times. Our speeds held mostly in the 7 to 7.5 knot range and we were jubilant as we ticked down the minutes to arrival. Birds! We must be getting close! Great Inagua is out in the middle of nowhere. It is just a stone’s throw from Cuba and is surrounded by deep water that goes from literally thousands of feet deep – abruptly to 20 ft. very close to shore. I wondered what that would mean for our approach. Could there be crazy current or huge crashing swells? Luckily, we had chosen an anchorage tucked behind an arm that would protect us from the northerly swell and wind. It was strange to go from the rollicking seas to the welcoming little bumps that guided us gently to our anchorage. We could see the stark contrast in the color of the water where it was over 300 ft and then it was 40 ft. and quickly decreasing as we approached the now-familiar glowing green of our anchorage. I have to thank the creators of Explorer Charts for giving us this gift. I would never have approached this anchorage without their promise that we could do so. There were coral heads littered everywhere protecting the white sand close to shore. We rolled up the jib and dropped the mainsail and motored over the coral and found our spot exactly where Explorer said we would find perfect sand. The anchor dug right in and we shut everything down. We tidied up the rigging and covered the mainsail and sat down with a well-deserved and long awaited Sundowner.